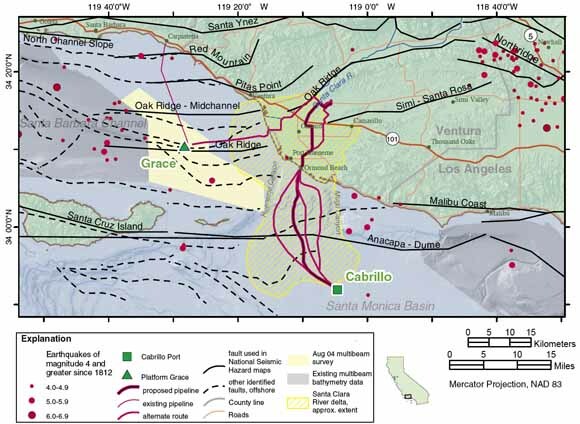 This report examines the regional seismic and geologic hazards that could affect proposed liquefied natural gas (LNG) facilities in coastal Ventura County, California. Faults throughout this area are thought to be capable of producing earthquakes of magnitude 6.5 to 7.5, which could produce surface fault offsets of as much as 15 feet. Many of these faults are sufficiently well understood to be included in the current generation of the National Seismic Hazard Maps; others may become candidates for inclusion in future revisions as research proceeds. Strong shaking is the primary hazard that causes damage from earthquakes and this area is zoned with a high level of shaking hazard. The estimated probability of a magnitude 6.5 or larger earthquake (comparable in size to the 2003 San Simeon quake) occurring in the next 30 years within 30 miles of Platform Grace is 50-60%; for Cabrillo Port, the estimate is a 35% likelihood. Combining these probabilities of earthquake occurrence with relationships that give expected ground motions yields the estimated seismic-shaking hazard. In parts of the project area, the estimated shaking hazard is as high as along the San Andreas Fault. The combination of long-period basin waves and LNG installations with large long-period resonances potentially increases this hazard.